From the US National Archives “Document for Today” collection, Today’s document describes what to do in the event you are on a climbing expedition in search of Yeti, AKA the Abominable Snowman. The scanned document is below. 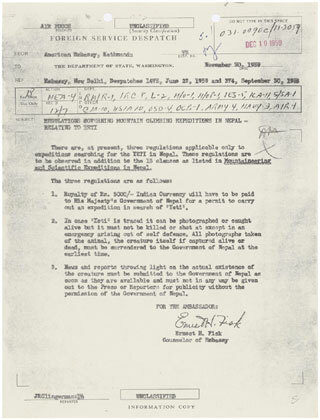 “Regulations Governing Mountain Climbing Expeditions in Nepal – Relating to Yeti”; UD-WW, 1454, , Box 252, Accession #64-9-0814, folder 5.1 Political Situation – General, File ended Dec 31, 1959; Records of the Agency for International Development; Record Group 286; National Archives.